Nathan Overbay’s seven-yard touchdown reception with just over three minutes left in the fourth quarter was the difference as Tampa Bay got past Miami, 17-13, in preseason action. Rudy Carpenter threw the game-deciding score, finishing 5-of-8 for 59 yards for the Buccaneers, who saw starter Josh Freeman strike for 149 yards on 12- of-23 completions. Earnest Graham added a second-quarter TD run for Tampa Bay. Chad Henne finished 10-of-13 for 175 yards and a touchdown to Brandon Marshall for the Dolphins. Marshall ended with 90 yards on a pair of catches and Dan Carpenter added two field goals in defeat. 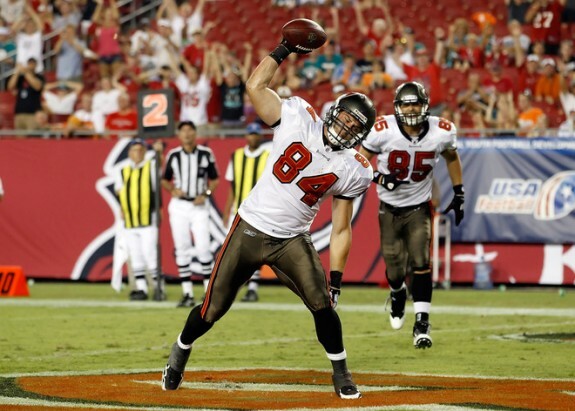 Overbay’s catch capped a 71-yard, 10-play drive and put the Bucs on top to stay. Matt Moore — who ended 8-of-16 for 90 yards — was forced into an incompletion on 4th-and-4 from the Dolphins’ 30 with just over a minute remaining.